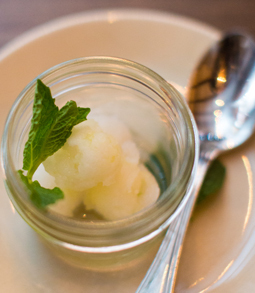 Kokomo Verjus Mint Sorbet - A recipe from Savor California, the online showcase for extraordinary gourmet foods and beverages from California. Start by creating a mint simple syrup. In a medium saucepan over medium heat, combine sugar, water, and mint leaves. Stir until mixture comes to a boil and sugar is dissolved; reduce heat to low and simmer 5 minutes. Remove from heat; pour syrup mixture through a fine strainer over a large bowl (straining out the mint leaves). Add Kokomo Verjus and vodka to the strained syrup mixture; stir until thoroughly blended. Let mixture cool to room temperature. The vodka (or any other type of alcohol) will ensure a soft consistency to the sorbet, as the alcohol itself does not freeze and adding a little bit keeps the sorbet from doing the same. We recommend vodka, since it won’t flavor the sorbet. Transfer mixture to ice cream maker, and follow manufacturer's instructions. Pour into a shallow container, cover and place mixture in the freezer. When it is semi-solid, mash it up with a fork and refreeze again. When frozen, place in a food processor or blender and process until smooth. Cover and refreeze until serving time.